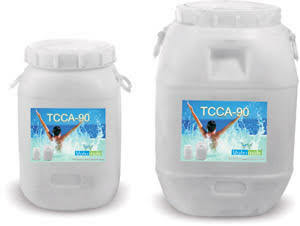 PRODUCT DETAILS - TCCA-90 Granules Specially Imported For Swimming Pools Water Treatment, Power Plants Water Treatment, Industrial Use in Raw Water Purification. Specification : Min. Chlorine Content 90% in the form of Granules Packing Type : In 25 KG & 50 KG HDPE CAN We offered High Quality TCCA-90 in the form of Granules. This is Specially Imported For Indoor & Outdoor All Types of Swimming Pools Water Purification. This Product is Very Effective & Safe to use. It Cleans Water Quickly & Removes Odor From Water and keep water crystal-Clear for Swimmers without Any irritation to skin.